Pack Your Knitting Bag For Summertime Fun! We've got a month full of great programs, event, and classes on the calendar this month so save the dates and stock up on yarn! Announcing Our NEW Customer Loyalty Program! We can't wait to see what everyone is working on! Do you need help starting a knitting project? Are you in the middle of a project and need help? Do you just need help on several projects? This is the class for you! The class meets once a week during the month of June. Please join us at Battery Park next to City Market with your knitting project. We will have coupons for local food vendors and giveaways. Benches and picnic tables are available. Knitting can be such a solitary act that it’s easy to knit alone somewhere and sink into your work without thinking about all the other knitters out there. Not this day! 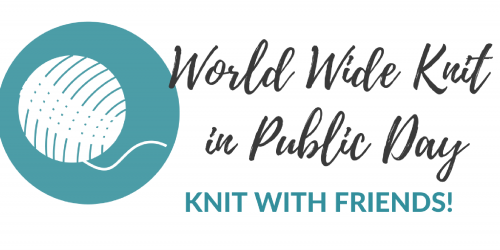 Let's take over the park and show others how fun knitting can be! Stop in and redeem your blue bead to get 20% off! Don't have beads on your blue bag? Visit and get your beads today!